232 p., 14,7 x 20,8 cm. 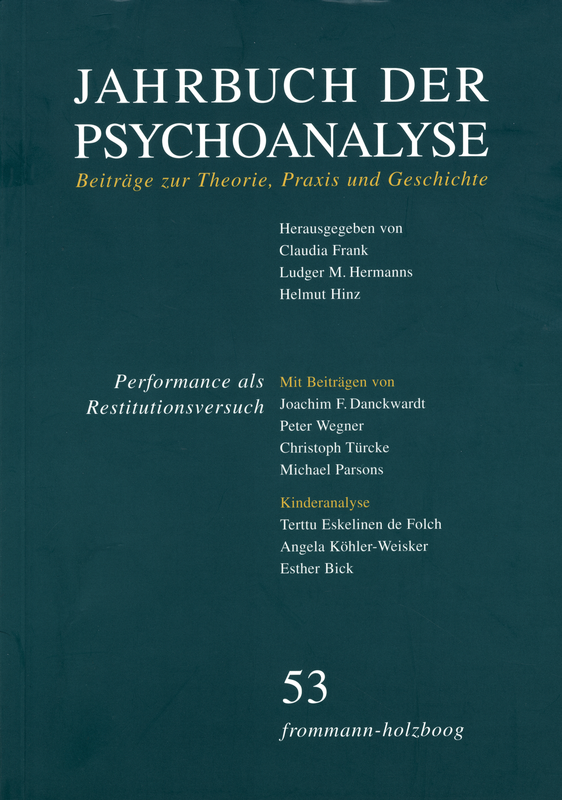 With contributions by Esther Bick, Joachim F. Danckwardt, Rivka R. Eifermann, Terttu Eskelinen de Folch, Gerhard Fichtner, Angela Köhler-Weisker, Michael Parsons, Christoph Türcke and Peter Wegner. Performance is a term which psycholanalysis adopted from art, a term which is said to cover those phenomena which may not be covered by the well-known concepts of enactment and involvement. Performance is defined as an action done to acquire meaning. It takes place wherever the stimulated identity leads to overwhelming processses of countertransference and transference which can be transformed if anything into an interpreted identity only in a co-creation. In this context, performance, in analogy to the well-known concepts, initially represents an area of unrecognized acting which lays itself like a dressing on a wound and bridges the gap between the ego and reality, between the analyst and the person being analyzed. Whereas Freud thought of a gradual increase in the gap, the possibility of closing this is seen here. What happens when the analyst has a sense of being annihilated by the patient? Analysts have a tendency to use general and that means simplifying constructions such as destructiveness, psychosis or death instinct to interpret the experienced phenomenon. The author’s view is that these constructions in the end evade rather than mirror clinical reality. Recent research points to promising possibilities of differentiation, e.g. psychotic mechanisms which are – as yet undiscussed – based on Freud’s notion of the partial »rent in the relation between ego and external world«. These findings emphasize the restitutive function of a symptom and the disturbing or destructive quality of a relationship as an obstruction of the treatment – not understood as yet – instead of solely stressing the destructive meaning in a way that taboos further perception. The concept of ›performance‹ as used in the art world is introduced to replace simplifying models by more differentiating interpretations. In what way performance differs from related and already established concepts such as acting out, enactment or role responsiveness is defined and explained. The paper explores the question of how the perception of unthought certainty in the patient’s performance can either be recognized as a drafting or organizing activity or as the destruction of the present relationship in order for a new one to emerge. The evidence from a detailed clinical example shows that many treatments can fail at this point, and demonstrates how an understanding of performance in this sense offers a chance for integrating processes that otherwise hamper treatment. Today, the traumatic repetition compulsion appears only as cracker of the nerves. In fact, it started out as a founder of culture and civilization. Mastery of horror by repetition of the horrorful is an elementary technique of culture: the logic of the archaic sacrifice. Freud did not really allow his great discovery to affect him, namely that the traumatic repetition compulsion is »more urgent« than Eros and belongs to the »prehistory« of the pleasure principle. The drumfire of audiovisual shocks, however, which the sensation machinery of mass media is shooting onto the nervous system brings unexpected and new actuality to his discovery. Psychoanalysis may be seen as a ›cure‹ which aims to put right what has gone wrong in a person’s development, or as a ›healing‹ process aiming to make fresh psychic growth possible. Healing of any sort requires not only the right interventions, but the right sort of environment. In psychoanalysis, the environment is constituted by the quality of the analyst’s listening. Clinical material is given to illustrate this. These topics are linked to the relation between ego and reality. A theoretical viewpoint that asserts a primary division between the ego and external reality, will see the task of interpretation as being to cure the problems that the wish to deny this rift has caused. A viewpoint that sees ego and the external world as differentiating out of an original unity will see interpretation, by contrast, as aiming to facilitate in patients a lifelong process of psychic growth. The term »transference« (Übertragung) was first used by Freud in its psychoanalytical sense in the »Preliminary Communication« (1893a) published jointly with Breuer. However, this term is tinged with numerous connotations which can be traced in Freud’s writings before 1893 and which are only partly expressed in the English translation of the term as »transference«, namely Übertragung as 1. change of place, 2. analogy and metaphor, 3. translation, 4. transmission of a disease and 5. transfert (a term that plays an important role in French discussions of metallotherapy and hypnosis). It is only by taking all these levels of meaning into consideration that we can fully understand why the term Übertragung seemed to Freud particularly suitable to designate a central phenomenon of psychoanalytical therapy. In the course of the formation of The Interpretation of Dreams Freud repeatedly referred to the difficulty in having to refrain from revealing personal material to his readers. On a number of occasions he cited in this connection from Goethe’s Faust saying, »Das Beste, was du wissen kannst, darfst du den Buben doch nicht sagen«. Aclose reading of the extracts in his Dream Book and in letters to Fließ, in which the citation appears, demonstrates various aspects of Freud’s inner conflict regarding the concealment from his readers, as well as the revealing to them. I argue that this conflict is inevitably enacted by Freud in his writing, thus inadvertently supporting Freud’s claim that, due to the unruly nature of our unconscious mind, no one is »master in his own house«. His conflicted inner relationship with his prospective readers is further demonstrated through an examination of the contradictory roles he assigns to Fließ, at times his »first reader«, at others a »kindly disposed audience« and yet again a »critique«, who variously idealizes and disparages him. In psychoanalytic treatments with disturbed children and adolescents, the strength of projective mechanisms, the primitive defences and the need to control distort space and time and are projected on the analytic frame. Thanks to his/her containing capacity, the analyst allows step by step to lessen the mechanisms of splitting and fragmentation and this lessening restores balance between the internal and the external worlds of the patient. Esther Bick, who mainly became famous for her idea to integrate infant observation in analytic training, is introduced in her scientific development. Coming from the Viennese school of empirical research established by Karl and Charlotte Bühler, she devoted herself to psychoanalysis after emigrating to England. Although she completely supported Melanie Klein’s school, in her own independent scientific work she is also committed to Balint and the Budapest school. Her concept of »primary skin containment« describes the earliest normal phase of development, whereas the concepts »second skin containment« and »adhesive identification« describe primitive defenses, which she developed from her analysis of children and adults as well as from baby observation. Finally, the ambivalent attitude towards the application of infant observation in psychoanalytic training at the Frankfurt Psychoanalytic Institute is presented.